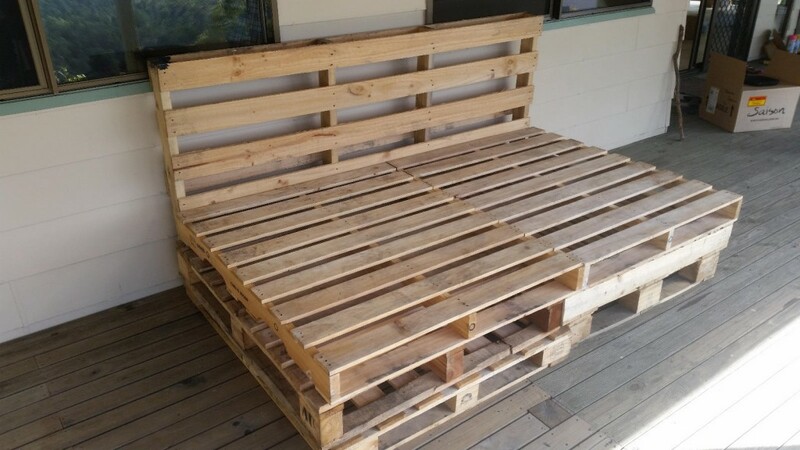 It seems that “pallet furniture” is all the rage at the moment, and we use pallets regularly for many things. Compost piles, Solar storage boxes etc etc. So making a Daybed from pallets was a relatively simple job and something we planned to do since we arrived. 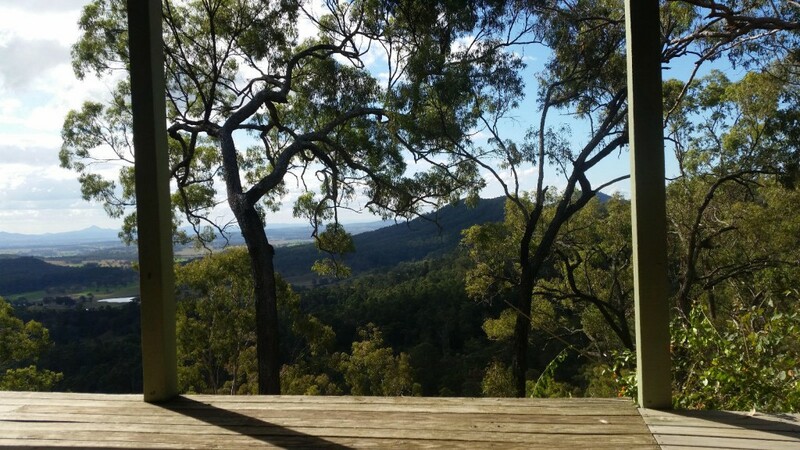 We have a massive deck here at Arborlon, and a spectacular view that runs the entire length of the house. So we wanted to take advantage of every angle and view. Building a Daybed mid-deck was the perfect answer. 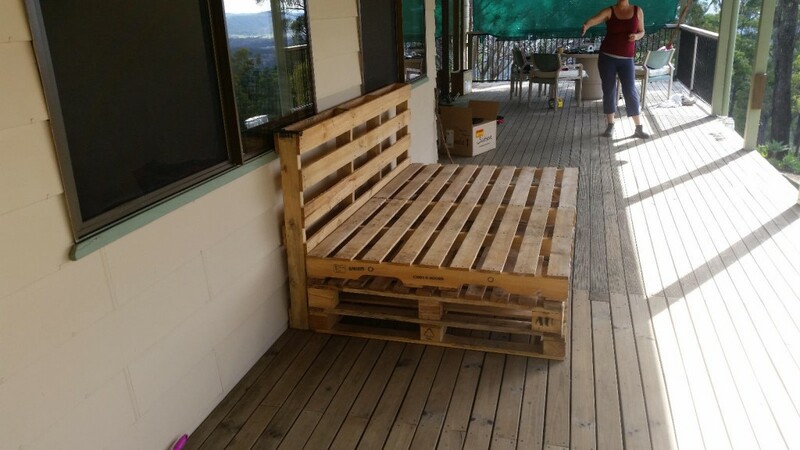 ….and doing it with recycled/reused Pallets was a simple and sustainable way to do it. 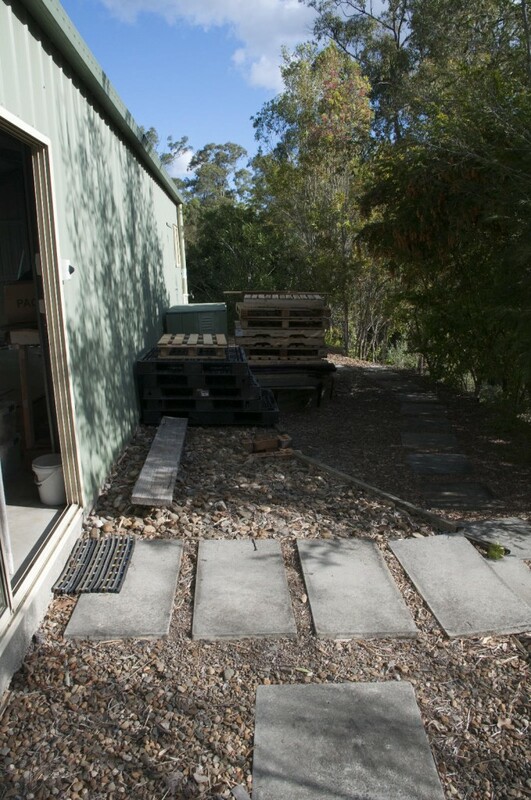 We had been collecting pallets since before we left Brisbane, so we had a number of them here already. It was just then a matter of selecting and sizing a number of pallets and constructing the day bed. 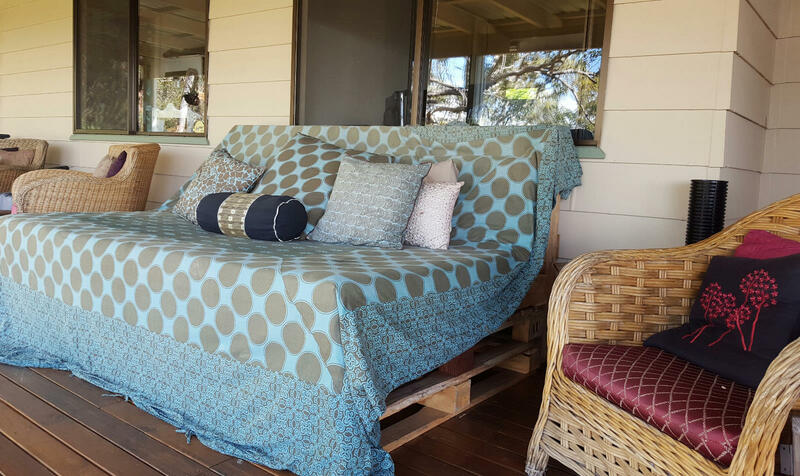 A Pallet Daybed can be constructed with just 8 pallets. 6 pallets form the base, and two pallets form the back. The addition of a foam mattress completes the construction. This is a really simple daybed, and we did it that way for the simplicity, and for strength and so it can be moved easily if needed. To ensure that your daybed is strong and secure, the secret is selecting pallets that are the same size, are structurally intact,and relatively light. The real key is the size. Put Two pallets(or one double-sized) vertically against the wall. Put Six Pallets in piles of three in front of the pallets against the wall. If your pallets are the same size, there is no mucking around. Ours were slightly different in size and depth, so we had to move them around a few times to form the base and get it level. We had luckily picked up a double -sized pallet recently, so doing the back was super simple. We already had a old double-bed camping mattress that we were going to use as the mattress on our daybed. It was a foam mattress, about 10-15 mm thick that I got from Clark Rubber many years ago. It has a cloth cover, and we also put a double fitted sheet over it. So we put the mattress on top of the pallets, and ‘bent’ it to form the backrest of the bed. It fitted perfectly, and did not move around. It hangs over the front a little, but we did that deliberately so that we had some protection for shins against wood. 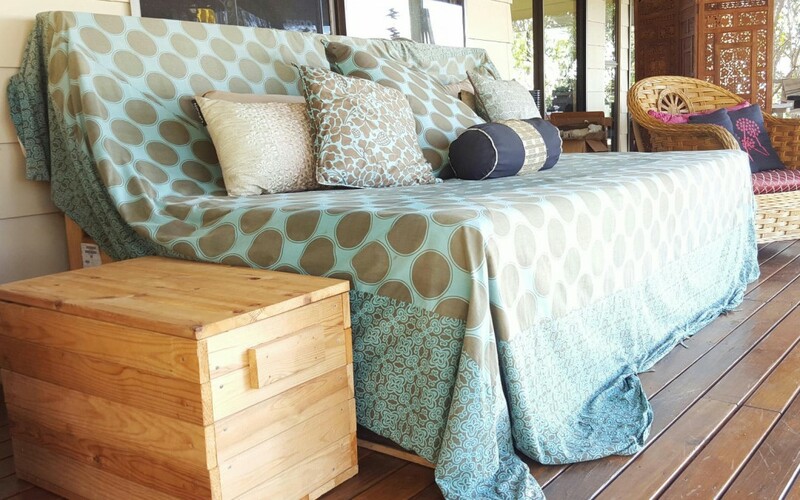 With a few magic style touches from Shionagh, we had a slick looking daybed that was cheap, super comfortable and perfect for what we wanted on the deck. The Daybed is one of the simplest and definitely one of the best improvements we have made since we got here. It is perfect for relaxing on as the sun disappears across the valley. Find some pallets and have a go.. it’s worth it.